In my last post, you may remember that I have made it my mission to be calm in the mornings with my kids. I’d like to tell you proudly that I made it through the week with exemplary calm! But I didn’t. Not quite. I think it comes down to a sleep problem – one I don’t know how to solve. There exist those families whose kids go to bed and conk out right away. (My sister-in-law’s son actually ASKS to go to bed when he’s tired. WHAT.) Similarly, there exist those families whose kids pop out of bed super-early on their own and are ready to go. Not our family. I know that’s a blessing in many ways. My kids don’t get grumpy or whiny at bedtime – instead, they tend to be at their most hilarious (to each other) in that post-dinner period. And they usually sleep in like champs while on vacation. Natural night owls, it seems. The night-owl thing is tricky, though. Trust me, we do all the things. We have a consistent bedtime routine. We do settling-down activities like reading, all in the same order. We dim the lights beforehand. We use the kid-safe calming essential oils. We give the hugs and kisses and love. They just… take forever to fall asleep. Especially E. We’ve tried all kinds of bedtimes for him in the hopes that we’d find the perfect one, but he still seems to spend ages awake most of the time. His brain apparently revs high when he’s in bed. I have to remind him to close his eyes and whisper inside his head instead of out loud. But this fact makes school mornings hard, especially now that their morning bell is fifteen minutes earlier than it was last year. Please know I’m no morning star myself. (Hence that failed snooze-button resolution.) Once I’m out of bed, I start by opening the blinds in the kids’ room (which doesn’t help at this veil-of-darkness time of year) or putting the small lamp on. Then I’ll cue up some music or a meditation right by E’s head where it will (I hope) gently awaken him. AB usually wakes up at this point, and betakes herself to my bed for our non-negotiable snuggle. [It has taken us a long time to get this part right. There have been countless times – and they still feel perilously probable – that she has begun the day with a sweet li’l temper tantrum because I happened to be in the bathroom when she came to my bed, or it took me too long to find E’s music, or I said the wrong word to her, or whatever other tiny random glitch she decides is insufferable that day.] She proceeds, almost always, to fall right back to sleep whilst somehow taking up almost all of my bed space. Ach. Written out like this, all the tender enablement is a bit nauseating. I can understand if at this point you’re like, Just rip their covers off already!! Or maybe just sneak headphones onto their ears and blast Van Halen without warning. This kindly moderation would all be worth it if they then got up, sunny-faced, and put their clothes on with something resembling promptness. Instead, this is the part where they sit there like tiny stoned college kids: AB will open a drawer and just stare into it. E will sit there indefinitely with his shirt off and his splendid bedhead belying his torpor. In the old days of 2017, this would be the point where I would start to get agitated and my voice would begin to sound stressed. For E, the second he detects annoyance in my voice, he feels entitled to go, “OHKAYEEEE! !” like I screamed at him. Which does nothing to lessen my annoyance, obvs. By the time we would get downstairs, I’d be fully frustrated, so when the kids would start to bicker at the breakfast bar I’d just be like “NO WE ARE NOT DOING THIS.” And when breakfast was done and the slo-mo would start all over for getting backpacks and snow gear on… Blahhh. You can imagine the tears, the stomping, etc. The kicker is, I know that when I get mad, I escalate the kids. I’m the adult. I should be able to fix this. Reflecting on the whole situation over the holidays, I said to myself, This is why I’m part-time. I am voluntarily making less money so that I have time to do things like take my children to school. If we’re late, so what? We’re late. It’s fine. Worth it to have a calm morning. And it TOTALLY IS. The first four mornings of last week, I would say, just once, “Okay. Well, I need you to get those clothes on if you’d like to be on time.” And if I saw our window of punctuality closing, I’d just be like, “We’ll be a little late, okay?” And if I kept calm, the kids kept calm, in almost every case. This is in spite of it being the first week back after winter break, and the kids being overall quite tired. We were late twice out of four days, but whatevs! Honestly, the rest of my life was better for it. I was calmer with my students, so they were calmer with me, and I had more energy after school to be nice to my family. I enjoyed them all way more. Sadly, on Friday my calm ran out. Tiredness of kids + not a great sleep on my part + not a great time of the month for me + the voice in the back of my head saying We’ve been late twice already this week = I started to sound like my bad old self. So E started to sound like his bad old self. Suddenly AB was getting tearful about something too. How quickly it all unravels. It wasn’t disastrous… I was just thoroughly disappointed in myself. And sure enough, we were late again. We’ve had a nice weekend. Our Friday night was Gryffindor Night, which was awesome and I’ll tell you about that later. 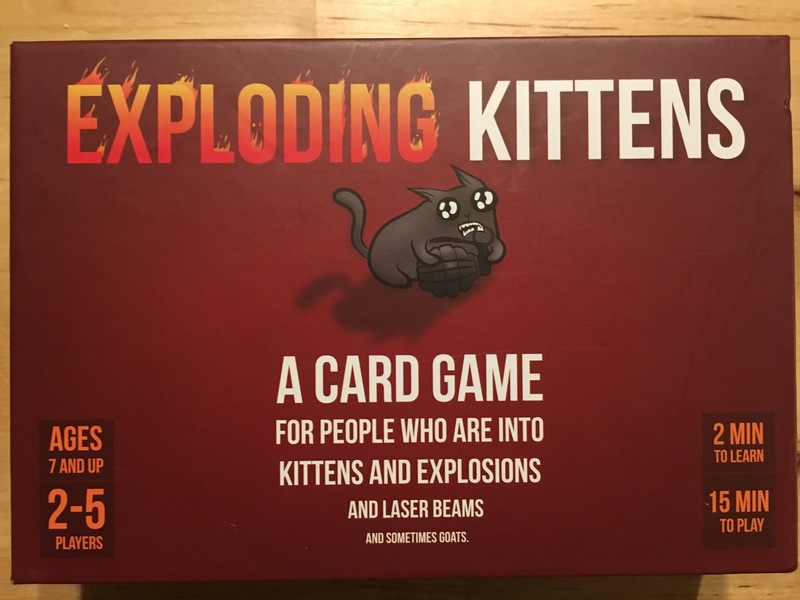 We have also cleaned house – all of us – and played lots of Exploding Kittens as a family this weekend, which feels very apropos in terms of the kinds of tempers we have and the abruptness with which they detonate, AND is very fun as a silly game we can all play and not stress about losing. So tomorrow morning, Paragon of Calm will make a comeback. Now with even more panache. Dear Students on Social Media: How Do You Manage? Dear Kids: For the record, you adore each other. I believe in you. Blessings, my child.